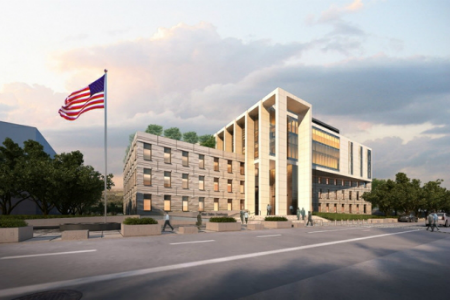 The new US Federal Courthouse will house US District Courts, US Courts, US Marshall’s Service, US Attorneys, US General Services Administration Offices, and controlled-access parking facilities. The 146,742 sf courthouse will be built to achieve a minimum of LEED-NC Silver Certification from the United States Green Building Council (USGBC). This courthouse will be constructed using the design-build method incorporating GSA standards, P-100 Public Building standards, and National Energy Policy Act standards. E Cube is providing LEED based commissioning services including Fundamental (EAp1) and Enhanced (EAc3) commissioning. E Cube is teamed with Setty & Associates for this project utilizing IDIQ (indefinite delivery / indefinite quantity) and service-disabled veteran owned business criteria. Included in the systems and equipment to be commissioned are the Mechanical, HVAC, Plumbing, and Domestic Hot Water systems. Other scope included under the Commissioning contract include: Building Envelope, Lighting, and Electrical including Emergency Power and Photovoltaic. E Cube will also be providing a warranty review.